This may come as a total shock, but pure forms of illicit drugs can be hard to come by. Certain controlled substances are frequently adulterated, if not outright contaminated, by products that range from the household to the industrial to the pharmaceutical. Of course, some substances are more easily, frequently, and profitably adulterated than others: cocaine purchased on the retail level is on average 31%, well, not cocaine, while the purity of heroin on the street is even lower, resting around 65% (1). A diverse assortment of products regularly make their way into the “cut” of a powdered drug, including common substances such as sucrose, lead, glass, and flour as well as medications prescription and over-the-counter alike, including quinine, lidocaine, and the anti-parasitic drug levamisole (2). The aims of adding adulterants are many. Glass, for instance, serves no purpose other than to create a “bulking” effect. The bitter taste of quinine mimics that of heroin and so it is used along with glass to not only add weight but also flavor, thereby increasing its profit to the seller. But other substances have practical benefits to user and vendor alike: caffeine, a cheap and easily-obtained addition, causes heroin to vaporize at lower temperatures and thus allows for greater amounts of the drug to be consumed. Procaine, a local anesthetic, is added to heroine primarily to add volume to the drug, but happens to reduce pain at the site of injection as well. But random powders and miscellaneous pharmaceuticals are not the only lagniappe one can expect to find in the average street brew. As you have no doubt come to expect as a loyal reader of Body Horrors, there are assorted bacteria tossed into the mix – also free of charge! – that frequently contaminate the drug-making and drug-using process and which can lead to a stunning variety of infections. Salmonella-laced marijuana made headlines in the US several years ago. Strains of Clostridium have caused outbreaks of wound botulism and tetanus in users of black tar heroin (3). Pruno brewed in prison sometimes comes with a shot of botulinum toxin. But there is one microbe in particular, one that boasts a tabloid-worthy reputation, that has made a series of unexpected appearances in the past few years among heroin users: anthrax. 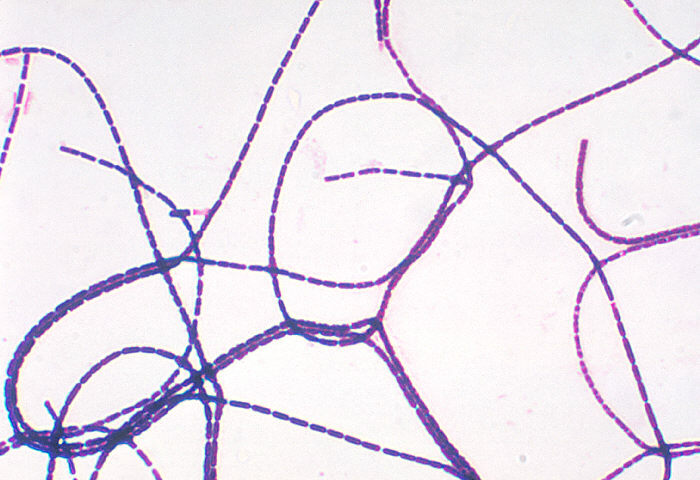 A photomicrograph of Bacillus anthracis. Image: CDC. Bacillus anthracis is a soil-dwelling microbe found globally in grazing fields. It is a hardy organism that protects itself from harsh environmental conditions by enveloping itself in a rugged coat, forming a spore; these spores allow anthrax to travel and spread with ease. Though cases of anthrax are rare, it most commonly infects unvaccinated herbivores in Africa and central Asia that inadvertently hoover up its spores while grazing. Anthrax also infects people that work closely with these hooved vegetarians and poses a relatively minor occupational risk for people that regularly handle animal products like wool, skins, leathers, and even meat. When anthrax completes its journey from the fertile fields to our equally nourishing organs, it nestles down and commences to spew out toxins that destroy cells and tissue, but its mode of entry into our bodies determines its clinical course. Whether the bacteria was inhaled inhaled, ingested, or introduced through a wound in the skin paves the way for the extent of the virulence and severity of infection. The manifestations of anthrax – its clinical course, management and treatment, severity, and its lethality – depends entirely on how it has entered the body (4). Altogether, anthrax infection comprises a range of possible manifestations including necrotizing fasciitis, systemic blood infections (septicemia), brain hemorrhage, and meningitis, an infection of the thin rubbery sheath of the brain, the meninges. Anthrax is a deadly disease with high rates of morbidity and mortality. Because it is, thankfully, also quite rare, it is relatively easy to track its whereabouts and going-ons when an outbreak occurs. Typically, outbreaks of anthrax have been traced to groups of people involved in high-risk activities involving grazing animals and their byproducts: anthrax favors shepherds, butchers, wool-sorters, leather workers, and even the odd drum-playing hippies. In 2009, however, an outbreak upended this pattern and targeted a novel population: heroin users, overwhelmingly those injecting the drug. 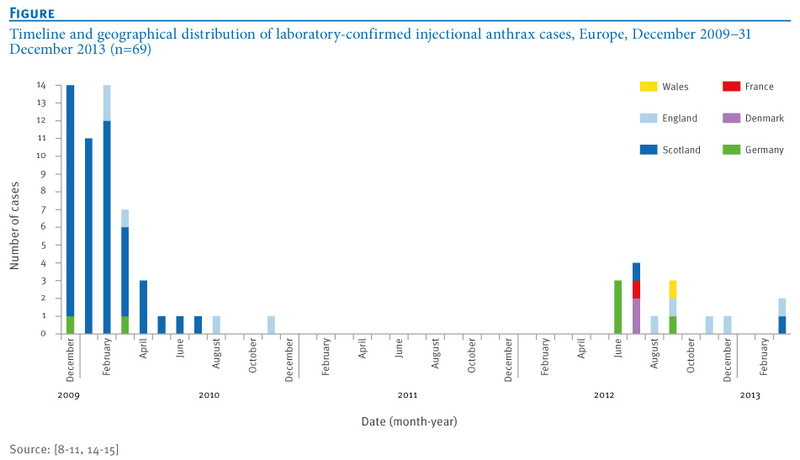 The timeline and geographical distribution of laboratory-confirmed cases of injectional anthrax in Europe during the December 2009 to December 2013 outbreak. Image: T Berger et al. See Reference (4) or click image for source. The outbreak reared its head unexpectedly when a Glaswegian man was diagnosed in December 2009. Within twelve months, 126 cases were identified in Scotland and Germany. Scotland suffered the most, bearing 95% of these cases. The outbreak peaked soon after it emerged in December, a fact which investigators associated with a a heavy demand for heroin over the holiday season (5). The outbreak dissipated until June of 2010 when fifteen more cases materialized, first in England and Wales and then popping up in Denmark, France and Germany. Though the outbreak is over, sporadic cases continue to be reported in West Europe. The disease itself was especially deadly in this outbreak, the infection generating a type of cutaneous anthrax that formed deep, pustulant though painless wounds accompanied by massive amounts of edema and swelling. Necrosis of skin and muscle would often follow, necessitating surgeries to debride massively infected arms, legs, and buttocks. Many infected patients died of sepsis and multi-organ system failure. The case mortality rate ranged from 30-47% (4). It was the first recorded outbreak of anthrax associated with heroin usage. This form of anthrax infection was so atypical and novel that it earned a new designation: injection anthrax. As one physician with the United Kingdom’s Health Protection Agency, Dr. Fortune Ncube, put it, however, “There is no safe route for consuming heroin or other drugs that may be contaminated with anthrax spores”(6). Though public health officials recognized the correlation between heroin use and infection, little else was immediately evident concerning the provenance of the pathogen. How is it that packages of heroin disseminated through Europe became contaminated with a microbe more commonly associated with goat-herders and butchers in Africa and Asia? The answer is totally unsatisfactory: it’s still unknown. Heroin samples obtained during the outbreak did not contain those hardy anthrax spores. However, it is widely believed that packages of heroin may have been wrapped in animal skins for trafficking purposes or an “animal derived cutting agent” like bone meal may have contaminated the drugs (4). Genetic testing of anthrax cultured from patients did reveal some clues on the identity of this “heroin anthrax” – patients shared a genetically identical strain, one belonging to the so-called “Trans-Eurasian group” of anthrax. A closer look of the microbe’s genetic signatures indicate that, phylogenetically and geographically, the injection anthrax strains are related to those found in anthrax-infected goats in Turkey (5)(7). The genetic and forensic evidence suggests that the heroin was likely of Afghan or Pakistani origin and had been transported to Turkey for processing, where it became contaminated with anthrax (5). This anthrax-laden heroin was then imported throughout Europe. Turkey is considered the singular source of the outbreak (7). This is consistent with the United Kingdom’s forensic investigation into the 2009-2010 outbreak that found that 80-90% of heroin reaching the UK originated from criminal networks based in Turkey (4). Furthermore, genetic analysis of these strains along with a closer look at suspicious and possibly related deaths in heroin users from 2000 to 2010 suggests that this outbreak may have gone undetected for many years prior. In 2000, a Norwegian that injected heroin appeared in hospital with anthrax; after some inspection it was determined that his strain of anthrax matches the same Trans-Eurasion group (8). Anthrax is widely feared for its potential as an agent of bioterrorism; the media-induced panic attack that is occasionally invoked usually relies on images of shadowy terrorist cells spraying spores from planes above cities or perhaps into malls filled with aimless shoppers. However, this frightful microbe’s recent entry into our communities was far more insidious and unexpected, relying on an altogether different type of illicit network that spreads harm. 1) United Nations Office on Drugs and Crime (2006) “World Drug Report 2006, Volume 2: Statistics.” New York, NY: United Nations Publications. 2) C Cole et al. (2010) “Cut: a guide to adulterants, bulking agents and other contaminants found in illegal drugs.” Faculty of Health and Applied Social Sciences, Liverpool John Moores University, Liverpool. 5) Health Protection Scotland (HPS). (2011) National Anthrax Outbreak Control Team: An outbreak of anthrax among drug users in Scotland, December 2009 to December 2010. Glasgow: HPS. 7) EP Price et al. (2012) Molecular epidemiologic investigation of an anthrax outbreak among heroin users, Europe. Wow. It makes you suspect that, other than depriving criminal organisations of a sizeable swath of their income, offering some sort of controlled legal access to currently illegal drugs would also be entirely sensible as a public-health measure. On a side note: The practice of diluting heroin in particular can have dangerous consequences even when the dilutant is harmless or even mildly beneficial, as the difference between a desirable recreational dose and a potentially lethal one is relatively small, it is not unheard of that heroin users accidentally overdose if they come across an unexpectedly pure batch after being used to something weaker. So this happened back in 2009? ….. I live in Montana where we raise sheep. Large animal veterinarians around here get vaccinated against anthrax regularly. So do those of living in certain castles with not very good names.